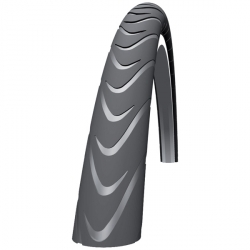 The Schwalbe Marathon Supreme is one of the most expensive touring tyres that Schwalbe make. This tyre benefits from all the high technology that Schwalbe have to hand, including "HD cermic guard" puncture resistance, "Triple nano" compound for all weather grip and lite-skin sidewalls for a supple ride and high performance. In theory this should be a tyre which does everything. It's light in weight, puncture resistant and claimed to be quite fast. However, our experience is that it's actually rather a slow tyre and this is a problem. Low rolling resistance isn't only important for racers. Actually, tyre rolling resistance absorbs a greater proportion of the energy of slower riders than faster riders because for the latter, aerodynamics become the most important factor. Slower tyres make cycling more work for everyone. For that reason we don't recommend the Marathon Supreme, with the exception that it is perhaps the most puncture resistant folding tyre available and therefore makes some sense to carry as a spare on longer tours. In this roll, it's more puncture resistant and durable than the Marathon Racer which we'd otherwise suggest as a good folding spare tyre. In our experience, the Marathon Plus gives both a better degree of puncture resistance for maximum reliability and lower rolling resistance for greater speed (especially when ridden in). We suspect it also lasts longer. Given that it costs less as well we think it's a bargain relative to the Supreme and we recommend the Marathon Plus as the tyre to fit to your bike before you go touring, or for most people for general use around town.